Rapid Environment Editor is an environment variables editor. Rapid Environment Editor includes easy to use GUI and replaces small and inconvenient Windows edit box. Rapid Environment Editor Features: Show environment vars as an editable tree; Ability to choose variable value using File Explorer tree; Automatically checking for invalid paths/filenames; Backup environment variables to the reg file; Drag'n'drop support to reorder values; etc. 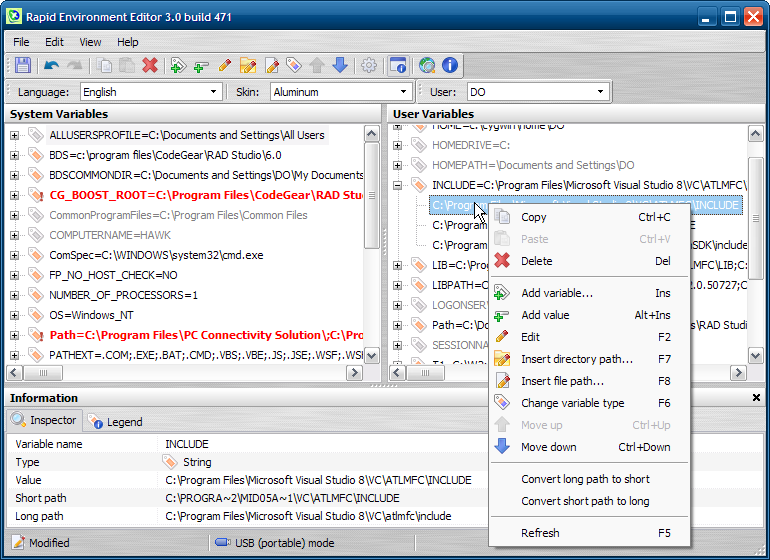 Rapid Environment Editor is a freeware Windows environment variables editor. Qweas is providing links to Rapid Environment Editor 6.1 build 807 as a courtesy, and makes no representations regarding Rapid Environment Editor or any other applications or any information related thereto. Any questions, complaints or claims regarding this application Rapid Environment Editor 6.1 build 807 must be directed to the appropriate software vendor. You may click the publisher link of Rapid Environment Editor on the top of this page to get more details about the vendor.